I didn`t yet color this drawing! So it is a gift like this if you would like to print it out on a postcard (a non glossy one that will take colors!) , and color it in the colors of spring and rejoicing!! Reading those lines, it was a first time that I had that feeling, it was not an `intellectual` knowing that this God who is the author of the Bible, and who did all the Miracles there is the same God who I pray to and have gotten to know in my life. It was more of an `experiential`, body and soul knowing that that this really is Him. Let the word of Messiah dwell in you richly, teaching and admonishing one another with all wisdom in psalms and spiritual songs, singing with gratitude in your hearts to God. And whatever you do in word or deed, do all in the name of the Lord Yeshua, giving thanks to God the Father through Him. 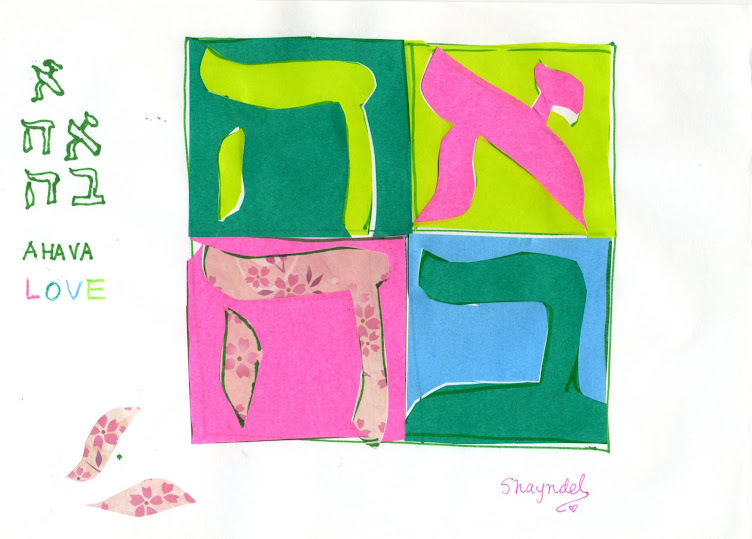 Thank you for this special week of Tu B`shevat, and for Your Word. Even though this is not a biblical holiday, LORD I feel you have been speaking to me through your Fruits! The pomegranates! The Israeli grapefruit, that was in our local supermarket once again just before Tu B`Shevat! And through the gardener who was pruning the trees and gave me the blossom. Your Word is living and alive, and everything in it speaks to us of your great Salvation. Yeshua is our Salvation! It is only through Your great Salvation that we can come to be free and know You, and to be in personal relationship with You, the Creator of everything, the Maker of Heaven and Earth. It was Your hand that gave me that branch, and the branch blossomed in my hand!! It was You who brought the worship song to the food floor of the department store where I was buying the ingredients for Shabbat!! It is You who gave us your Son so that we can have Eternal Life, and who sets us free so that we can Worship You!! Dear Father, I pray blessings and a fruit-full season of blossoming and rejoicing to each one who reads this, may you touch her heart, and may she know the resurrection power of Yeshua and your great Salvation in Christ Jesus!! Thank you Father, I pray, all Glory to You, in the name of Yeshua. The wilderness and dry land will be glad. and blossom like a lily. 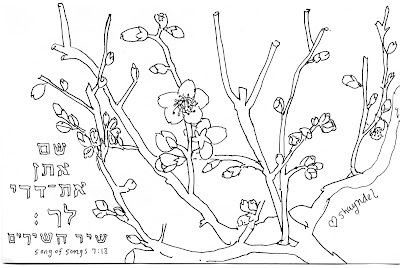 "I realized that the very same hand of God who parted the Sea of Reeds for the Children of Israel is the very same hand of God who gave me the plum blossom that opened on my Shabbat table last Shabbat!!" The same voice that spoke to Adam, speaks to us. Amazing, isn`t it Sandi!! I suppose you have known this, known Him and His voice for some time!! I feel like a baby I guess, just starting to know and hear the voice of my Father...or rather, surely I must have heard it before but something is new... Yes!! ♡ Shabbat Shalom! Thank you Joyful for sharing in the excitement, and our love for Him. Praise God! A blessed week to you!! Very beautiful Tu bi Shvat thanfkful letter to God, the creator of everything! I love the pictures and the drawing, the Song of the Songs and the Trees Holiday - go well together. Thank you Duta! To the Creator of everything, yes!! 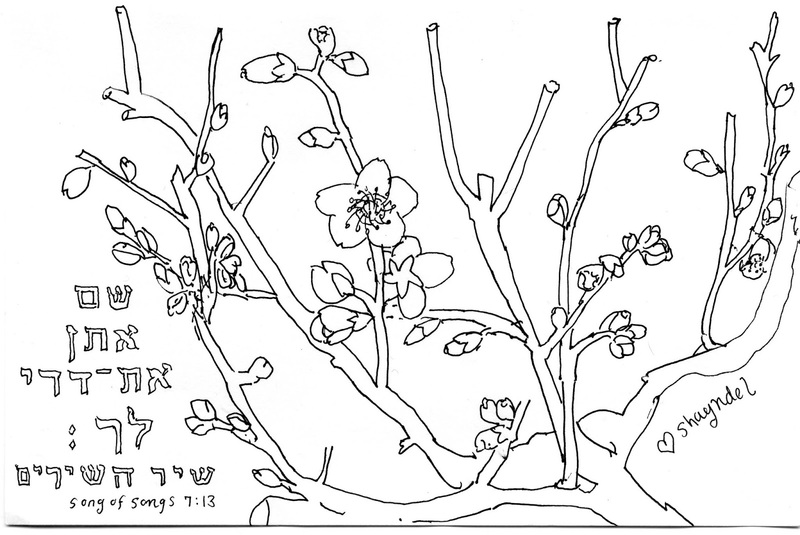 Hope you had a beautiful Tu bi Shvat, a blessed week to you!